As the population of the United States gets older and older, more and more people end up in nursing homes. In fact, the population of the elderly in nursing homes is soaring. Although the abuse and mistreatment of elderly people in nursing homes is appalling, it does occur, and litigation cases for this type of civil and criminal wrong are on the rise. Not only that, these cases are usually amounting to million dollar rewards in our court system. This work is how to go about conducting such investigations and a chance for you to learn about and develop a new area of private investigation that is definitely on the rise from expert Kelly Riddle. New and revised with added chapters. Available in Kindle E-book on Amazon. Discounted price offered on this site by author of $19.95, available on Amazon for $28.79. Printed and Copyrighted in 2014. Who’s Who In America……And Where Are They? Written with a hands-on approach for hands-on learning, The Art Of Surveillance covers different techniques, skills and knowledge needed to conduct a professional surveillance. The work covers equipment needed, types of surveillance, how to handle face-to-face contact with the subject, dealing with other PIs when out-sourcing cases, writing a professional surveillance report, marketing your services and the legalities of surveillance today. Having worked on more than 6,500 cases, Mr. Riddle is truly qualified to provide a unique insight into the world of surveillance. 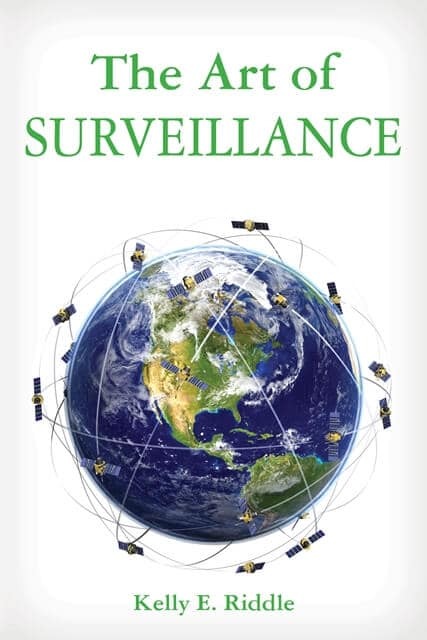 The book is written with a “hands-on” approach covering all aspects of surveillance. New and revised with added chapters. Available in E-book on Amazon. Insight, techniques and prospective on conducting insurance investigations is handed to you in this unique work by one of the investigator’s most favorite authors, Kelly Riddle. 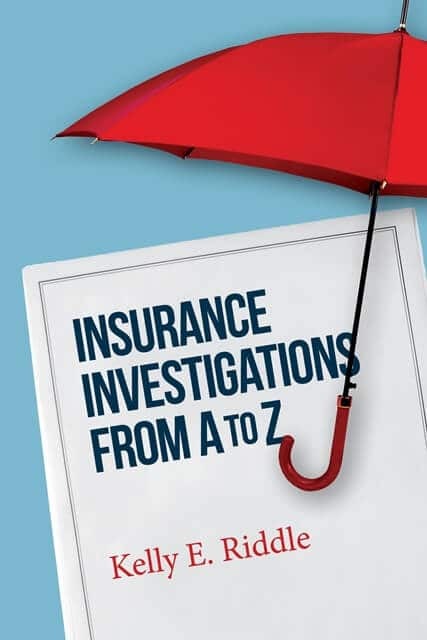 The insurance guide from A to Z contains the information every investigator needs to successfully conduct insurance investigations of all types. New and revised with added chapters. Available in Kindle E-book on Amazon. Discounted price offered on this site by author of $19.95, available on Amazon for $24.99. 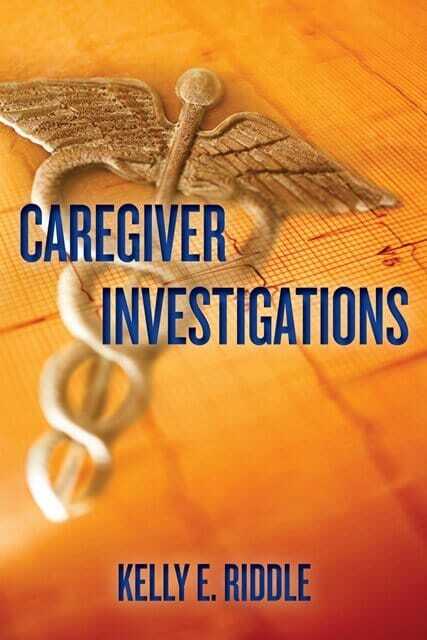 There are private investigative agencies that have extremely good investigators but don’t seem to have enough work. 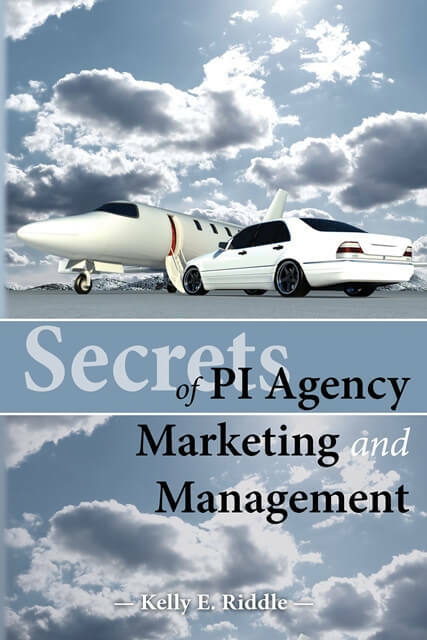 This extremely valuable work helps you avoid this very common syndrome and hands you the know-how to develop your investigative agency for a booming success. The difference between success and failure in the private investigative agency business is more than just being a top flight investigator. Marketing techniques, management skills and a knack for finding your niche is your key to building a lucrative private investigative practice. One of the nation’s most successful private investigators in America today, Kelly Riddle; shares with you his secrets to success using techniques and principles that have brought him an almost unheard of raise to the top of his profession! New and revised with added chapters. Available in Kindle E-book on Amazon. Discounted price offered on this site by author of $19.95, available on Amazon for $26.31. This bookwas written for the do-it-yourselfers. It teaches the reader how to investigate someone, check credentials, locate a former friend and more. Drawing on his experience of more than 18 years, Mr. Riddle teaches the reader how to use the “tricks of the trade.” The book also includes over 400 public names and address nationwide to Driver’s License Offices, Medical Boards, Bankruptcy Courts, Child Support Agencies, Secretary of State Offices and much more. Available in e-book. The book is priced at $19.95. To Serve And Protect: The True Story, is a revealing tell-all story of police corruption. Based on actual events, the author takes you through the excitement, joy and often humorous real-life circumstances of a police officer’s job. This book is a must for anyone involved in the criminal justice system or for anyone concerned about those who have sworn to protect our communities. 111 pages. Available in e-book. “The Internet Black Book” is a guide to Internet and e-mail investigations which provides information on how to conduct investigations. In addition, the book provides more than 100 topics commonly used by investigators and web site addresses for conducting searches. There are more than 100 pages of URLs available for access through the software package, Internet on Demand (see below). Available in e-book. Written as an instant guide on conducting investigations, this new work shows you the techniques and sources used to quickly conduct inquiries and record searches. This book is a revision of “Private Investigating Made Easy” with new information and computer investigation information. Check a person’s criminal history, civil history, find deadbeat dads, missing persons and more. New and revised with added chapters. Available in e-book. Internet on Demand is a compilation of Internet web sites designed to assist individuals in the research of information and records. The software includes more than 100 topics, the majority of which are free to access. Topics include: aircraft ownership, boat ownership, bankruptcy records, civil records, criminal records, driver’s license information, social security information, military locator services, physician verification, workers compensation records and more. Exposed:Secrets of America’s #1 PI is is a revealing look at the real world of America’s # 1 Private Investigator and the exciting life of a P.I. Based on actual cases, you will become involved in real life experiences so dynamic that you will feel as if you are in the shoes of the investigator. Until now, these cases have never been exposed. Read it, enjoy it, believe it, but don’t become one of the cases! Available in e-book. Since 9/11, business and industry has paid close attention to security within their own organizations. In fact, no other time in modern history has business and industry been more concerned with security issues. A new concern for security measures to combat potential terrorism, sabotage, theft and disruption- which could bring any business to its knees- has swept the nation. This has opened up a huge opportunity for private investigators and security professionals to conduct in depth security surveys so businesses will know exactly where security holes are present and where they need improvement to limit their exposure to such threats. Nationally known private investigator and author, Kelly Riddle; has been quietly providing this growing and booming service to business and industry. This manual is the result of his developed expertise in this booming area. This material explains in step-by-step detail how to go about offering and providing security consulting services as part of your overall investigative and security agency. Because of the boom in the demand for this type of investigative and security service, this manual hands you an opportunity to enter into a new investigative and security specialization that offers a substantial and lucrative increase to your investigative agency revenue. Available in e-book. To order by mail or phone call (888) 873-1714 or send a check and product request to Kelly Riddle, 2553 Jackson Keller, Suite 200, San Antonio, Texas, 78230. Note: Include $4.95 for shipping and handling.